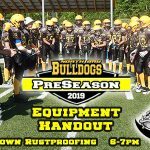 The Bulldogs Bantam, JV, and varsity teams have equipment handout from 6-7 tonight at Krown on Gormanville Road. You can also bring cash or cheque there tonight for player fees, or email transfer to Christa Morgan christa@d-linsurance.com, or by cash, cheque debit or credit at Source for Sports at 1333 Fisher Street. Also be sure to get your insurance done at http://ontariofootball.ca/page.php?page_id=83927 there is a fee of $50 for this. If this is not completed before our first game the player can not participate in the game. As per my earlier email, please continue to let me know if your player is not at Saturdays game and or if they are not taking the bus to or from the game. This allows us to know what coaches, water boys etc… can fit on the bus and allows coaches to game plan around players not able to attend. Remember to check and double check that you have everything in your bag to play, we do not bring extra, mouth guards, cleats helmets, pants etc. If you don’t have everything you just don’t play. 9-9:30 Arrive back at Rollie fisher. 3:00 arrival at 1 St Joan of Arc Drive in Maple. Please bring a lunch and snacks for the on the bus. Remember lots of water. No peanuts please this week and advise if anyone has peanut allergies. No Red Bull, no rockstar, no coffee for players on the bus, please. We will update the Facebook page to approximate time of arrival as well as game scores in case you can’t make it to the game. 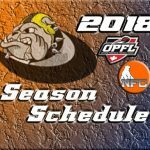 Summer is fast approaching and the OPFL and the NFC have issued their tentative drafts of the game schedule. This article is a compilation of information to help you navigate the game schedule and add clarity to the dates and time for practices and games. NorthbayBulldogs.com have provided a calendar with dates, times, and google map locations that can sync with your device at the links listed. Keep in mind that change happens so check back on a regular basis to ensure you have the current information. Please understand that the practice schedule is the same week in – week out so we are not going to show it on the website but it is on our printable calendar. For updates or changes, NorthbayBulldogs.com, your coaches, and our Facebook pages will keep you informed of upcoming events and changes. Weather will not cancel practice unless there is lightning in the immediate area or the city closes the field. We will let you know when the practice is called off. Otherwise, dress for the conditions. As you will notice practices are heavy up until our first game as we prepare to be ready game one May 19th here at home. (11 practices before game one). Please note all practices up to and including May 17 are at Omischl on Lakeshore. Starting May 18th onwards will be at Rolly Fisher behind the memorial gardens. Please try to make as many practices as possible as every practice there will be new plays being added. The Bulldogs are looking forward to a great season of action so we don’t want you missing any of the lead-up or the games. The 2018 Pre-Season is about to get underway. These indoor sessions are for our OPFL players. 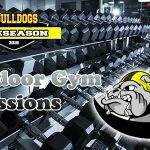 We have mentioned that in our preseason ramblings that we will be hitting the gym. This will involve: skills training and development and a host of other fun football-related activities to get the winter rust out of the system. These sessions are hosted at the Widdifield Secondary School gym – 320 Ski Club Rd, North Bay, ON P1B 7R2. Remember to bring water, gym appropriate clothes, indoor shoes and a positive Bulldog attitude.